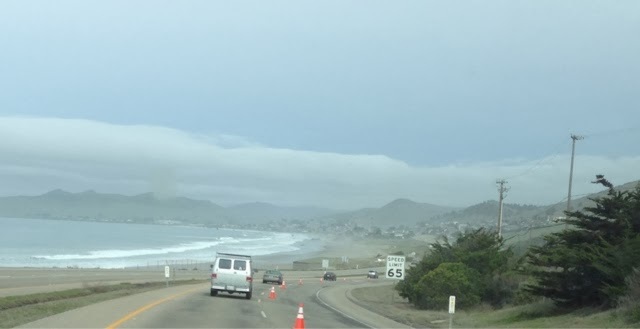 I woke to a mostly cloudy day that stayed that way on the way up the famed CA Coast Highway. 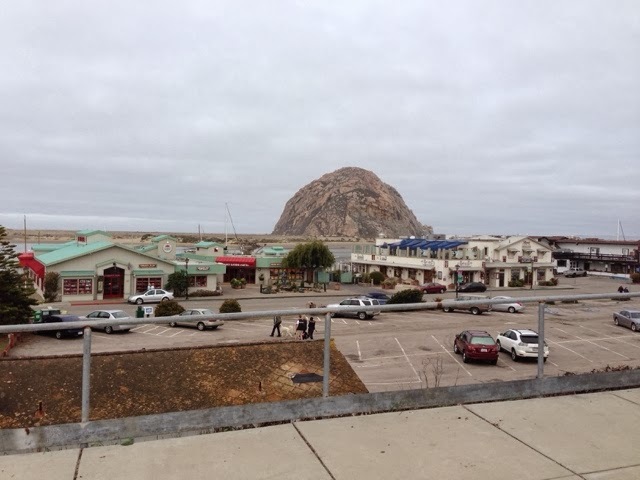 My first stop was Morro Bay. With a pleasant downtown with shops the land slowly slopes to the ocean and the view if the bay and this monolith out in the water. 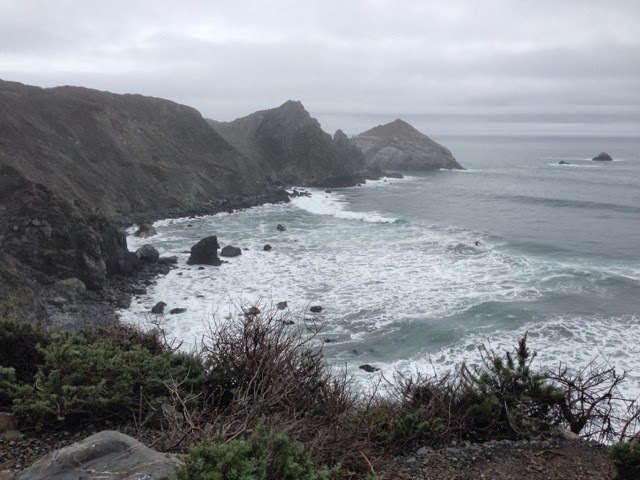 After this brief visit here in Morrow Bay I was back on the road to the Big Sur. The road is a surface road with 4 lanes for some distance with signs on the side of the road showing how the road will narrow over time. It eventually narrows to where the sides of the road on the northbound side are right up to the tar so it takes full attention to avoid drifting and scraping the side of vote van. 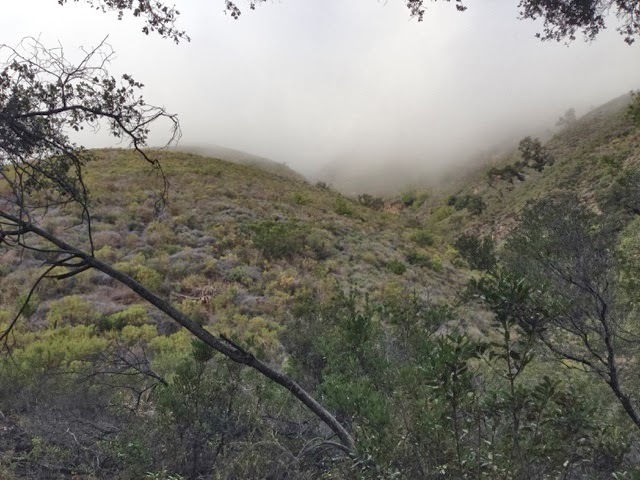 The low cloudbank up ahead was a sign of things to come. As you can see below the weather isn't getting better. 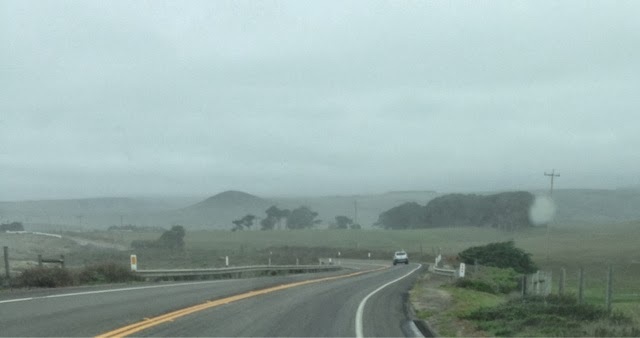 As I gained elevation I went into the low clouds and moisture that required intermittent wipers. 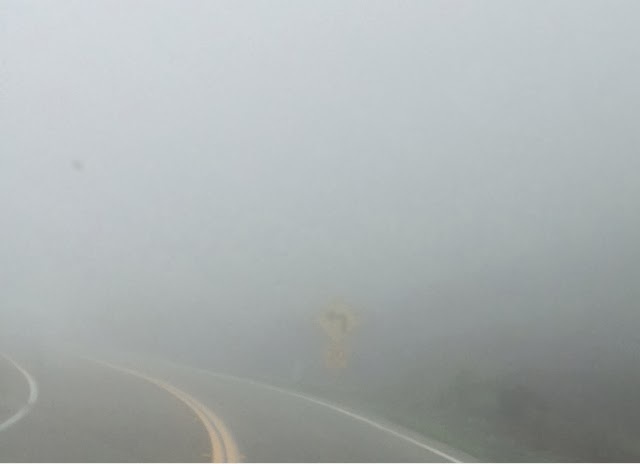 Then there were times when I was in spots where I could only see a few feet ahead of me. 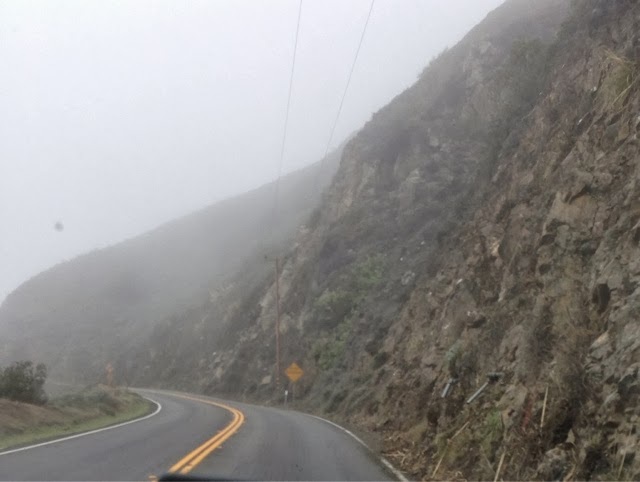 Luckily the switchback road that rap around the sides of these hills went up and down allowing times when visibility improved. Then I was able to see vistas like this. I came across this curious road cover. 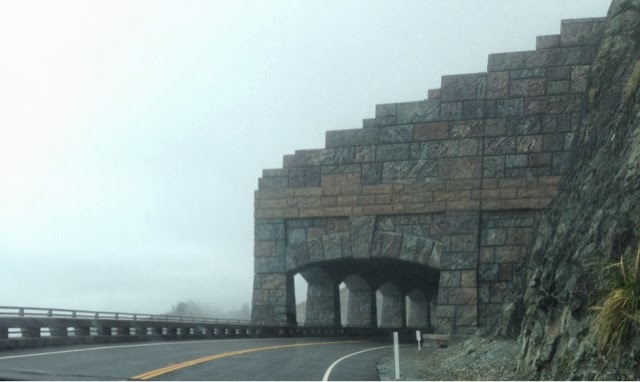 It's just a gues that it was built to keep rocks sliding down on the road. 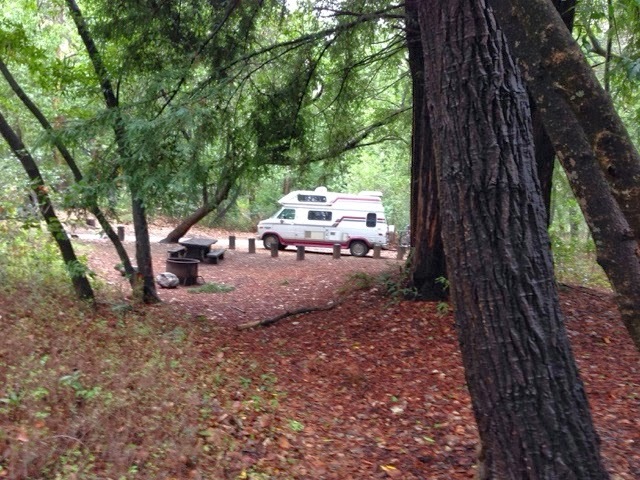 I arrived at the Big Sur Campground and I am sure lucky this is off season. I drove up without reservations and was told to go drive the camping area and write down a few sites I may like and come back. I pick a few and the check their list and I get my first choice. It was about 12:30 so I had lots of choice. By nightfall there were still plenty of open sites and only one coming section was open. When I was in Phoenix a few weeks ago it is their peak season and the state parks in the area are all booked through the season. I didn't care to see this sign while biking. 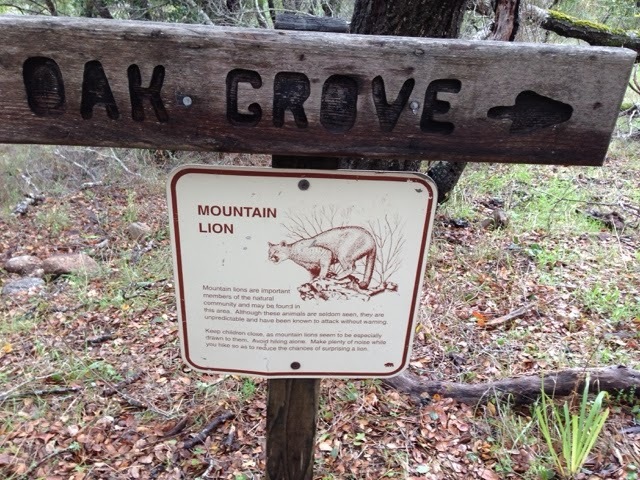 I remember a biker on CA was taken down by a Mountain Lion in southern CA. Now that I was parked for the night (there are no hook ups here) I went for a bike ride. 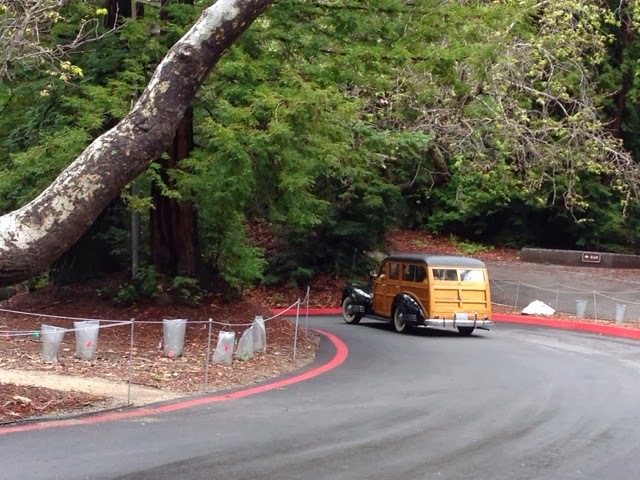 While st the Campground Lodge I saw this well maintained or restored Woody go by. It was now time for a hike to get in on before dusk. The sky was just clearing a bit also that made the hike nicer. 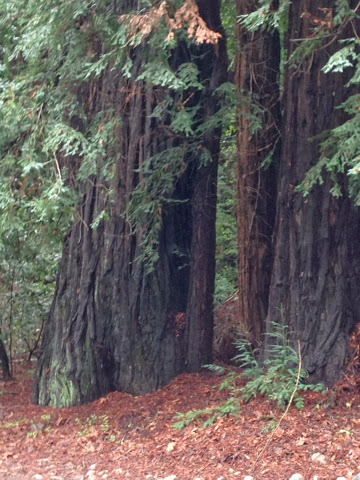 These 2000 year old redwoods were beautiful and the fauna gives off a wonderful smell. 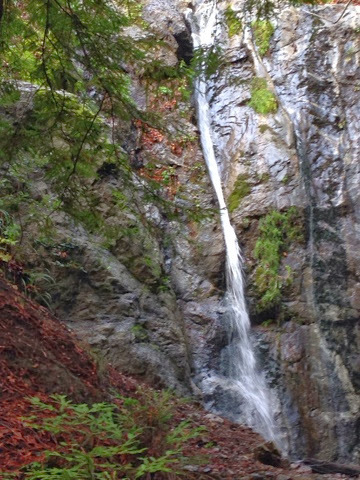 I hiked up the side of a mountain to see this waterfall. 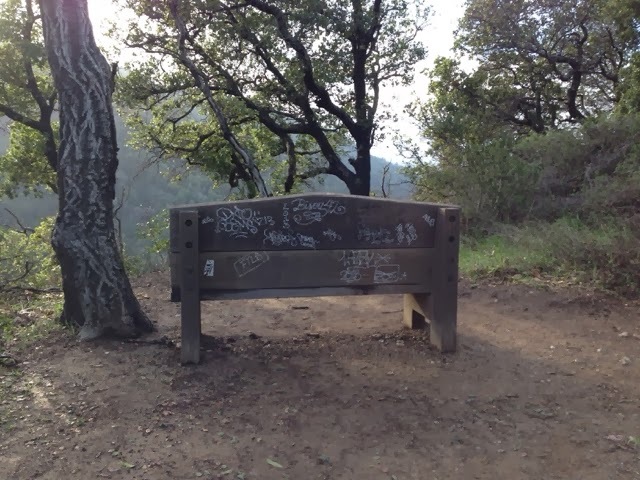 Then I went this other trail up the next mountain overlooking the valley where the csmpground is. The sun was starting to go down and the cooling air was starting to condense. Tonight without electricity I am living off the camper charged battery and writing this in the dark to save battery power. Since I have been on the road I have gotten all the appliances working. The core fridge is running off propane tonight. The stove is propane for cooking dinner. The water in my holding tank is pumped with a 12 volt pump off the camper battery and the propane heater uses the 12 volts from the camper battery for the blower. I don't use anything in the 12 volt system unless I need it to save power. I swapped all the 12 volt light bulbs in the camper to LED so also get the most out of the power in the battery. The TV is 12 volt too but there are no stations to pick up out here so I am listening to a portable battery operated radio for company. For cell signal I get 1-2 bars if I stand on the picnic table or since the camper is 9 ft tall put the phone near on dpot of the ceiling I can send and receive and get slow downloads. The girls face timed me and my connection caused the feed to be intermittent. Tomorrow I will be only going about 30 miles to Monterey where I plan on spending a couple days.